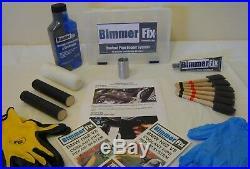 The Bimmer Fix Coolant Pipe Repair System is a fast and less expensive way to repair a Coolant Transfer Pipe leak in a BMW N62 engine. This popular V8 engine was used in BMW's flagship 735i, 740i 745i, 750i & Li series. 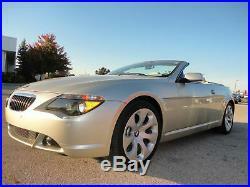 The N62 was also used in the sporty BMW 645Ci, 650i, as well as the 540i, 545i, 550i and the BMW X5 SUV. Please Watch our YouTube video for more information!! 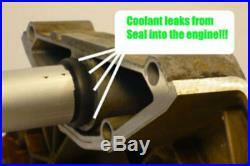 The Front Seal on this Coolant Transfer Pipe can fail in as little as 40,000 miles. The repair on this internal engine seal requires many hours of labor and can cost THOUSANDS OF DOLLARS!! A leaking Front Seal on a Coolant Transfer Pipe of the BMW V-8 N62 engine is a common problem that is very expensive to repair. When BMW originally built the N62 engine at the factory, the Coolant Transfer Pipe part. # 11 14 1 439 975. Was installed through the front of the engine block, before the installation of the Timing Chain Cover. However, once the engine is installed in the vehicle, it is very expensive to remove the Timing Chain Cover, in order to be able to install a new factory made BMW Coolant Transfer Pipe through the front of the engine. A new method has developed, which involves accessing the Coolant Transfer Pipe by removing the Intake Manifold. Once the Intake Manifold has been removed, then the old Coolant Transfer Pipe can be cut-out of the inside of the engine block, and a new "EXPANDABLE COOLANT TRANSFER PIPE" is installed in it's place. There are several companies who manufacture these Expandable Coolant Transfer Pipes. This is the most commonly used method of repairing a leaking Coolant Transfer Pipe because it is cheaper and faster to remove the Intake Manifold, than the original factory method of removing the Timing Chain Cover. The problem with both of these methods is that the Front Seal on both the factory installed Coolant Transfer Pipe, and the after-market "Expandable Transfer Pipe" could eventually LEAK AT THE SAME PLACE AGAIN in the future. Offers a MORE DURABLE METHOD of repairing a leaking Front Seal on a Coolant Transfer Pipe, that is also much less expensive to install. The seal created by the BimmerFix Stent is more durable because it is made of high-strength aluminum alloy that is made of a similar alloy as the BMW engine. The BimmerFix Stent actually provides a METAL LINER and bonds to the Coolant Transfer and Timing Chain Cover , using the special high-temp BimmerFix Coolant Pipe Sealant. This Sealant is able to be continuously immersed in antifreeze, and can withstand temperatures up to 500 degrees Celsius. The labor to install the BimmerFix Stent is only one hour more shop time than is required to replace the Water Pump. 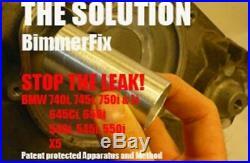 In fact, we recommend that a new Water Pump be installed when installing the BimmerFix Stent. 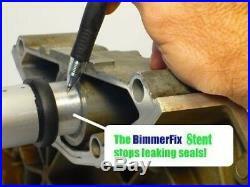 And, vise-versa, we recommend that a BimmerFix Stent is installed in a vehicle when the Water Pump is being replaced. This is an inexpensive preventative measure which could help to prevent future failure of the Front Seal of the Coolant Transfer Pipe. Couldn't have been better. Thanks for this useful package. It seems it solved my problem. Works excellent no problems, thank you. Cheap, easy, fixed the problem perfectly. Worked just as described, went in a littler harder, but did the trick. Got it within 2 days. 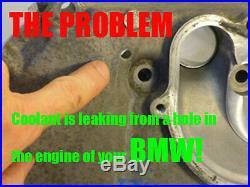 I repaired the weep hole leakage on my X5 4.4i N62 engine using the sleeve from Bimmerfix. It is an easy DYS project that required only removal of the water pump. The longer process was sanding the ID if the water pipe to fit the sleeve inside. Repair kit came with sanding rod and detail instruction. I made the repair approx. The product and instructions were exact. The only issue I had was the coolant pipe in my car seemed to be misaligned, I had to carefully use a half round fine file on the bottom half of the pipe. I have been driving the car daily and it is working perfectly. I would highly recommend this product. I just bought the car and I was a little upset to find this problem a month later so Thank You for a job well done. By the way my car is a 2006 750li with 180,000 miles and I did use the conditioner. Thank you again Michael Sweet. 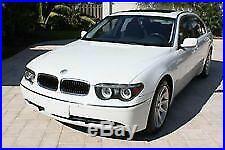 The item "BMW 545i 550i 645Ci 650i 735i, 740i, 745i 750 X5 E60 E63 Coolant Pipe Repair Kit" is in sale since Thursday, November 14, 2013. 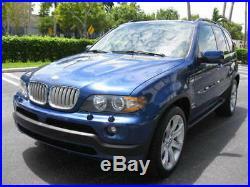 This item is in the category "eBay Motors\Parts & Accessories\Car & Truck Parts\Cooling Systems\Other".